Microbiologically Influenced Corrosion (MIC) is a significant degradation mechanism in nuclear and fossil-fueled power plants, chemical processing, refineries, pulp and paper, oil and gas production and distribution and the armed services. Essentially all cooling water and process water applications may be susceptible to MIC. Further, biological fouling, which is always a precursor to MIC, can reduce the efficiency of heat exchangers and fluid distribution systems and can interfere with water-based processes. The most common approach to mitigation of MIC is chemical treatment. Chemical costs for a large process plant are often on the order of $1,000,000 per year. Chemical toxicity is always a concern for plant personnel and the environment. This results in close scrutiny and control of effluents and chemical inventories by regulators, environmental agencies, and plant owners. The BIoGEORGE system was developed to provide online and real-time indications of biofilm activity on typical metallic surfaces. The probe is designed and operated so that microorganisms in the environment are encouraged to settle on probe surfaces well before they settle on heat exchanger tubes or piping. Probe status is indicated on the integrated electronics enclosure by an LED display (red light/green light). By closely tracking biofilm activity on the probe, the operator is alerted to the need to treat the system, to assess the effectiveness of a treatment, to schedule maintenance activities, or to optimize chemical treatments. The system consists of a probe, its integrated electronics, interconnecting cable, display software, User's manual, and product support. The probe is installed into a piping system, heat exchanger water box, cooling tower, or side stream via a 2-inch threaded connection. 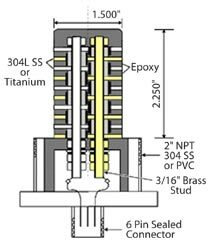 Special probes can also be built for "hot tap” type fittings or flow-through probes. The unit operates on a 110 or 220 VAC and has built-in battery backup. System data can be downloaded to the user's PC. Software is included with the system for analyzing the data and creating detailed trend plots. TM BIoGEORGE is a trademark of Structural Integrity Associates, Inc.